Home > Blog > Why Are Credit and Debit Card Fraud Alerts Going Up? Why Are Credit and Debit Card Fraud Alerts Going Up? In a recent poll conducted by CreditCards.com, nearly 4 in 10 customers say that they have received an erroneous credit card fraud alert. According to the poll, 31 percent of U.S. adults said they received a fraud alert about a credit card transaction and another 25 percent said that they received a fraud alert about a debit card transaction. These are up by more than 15 percent since 2015. A majority of the time, they are contacted by phone. A blocked charge could be an annoyance for customers looking to buy something. This is why credit card companies and banks like to contact the customers with an alert to make sure the purchase is being done by the cardholder. According to the poll, 37 percent of customers said they were trying to make a legitimate purchase when they received the alert. 15 percent said that the banks get it right sometimes. Finally, 24 percent said that the fraud alerts blocked illegitimate purchases. The poll also revealed that fraud alerts increased when you go up the echelon in income and education. Two-thirds of people who made $75,000 or more and two-third of college graduates said they received a fraud notification. Why the Increase in Fraud Alerts? There is actually a pretty simple reason for this: banks are trying to stop criminals, and they are constantly changing their algorithms to combat thieves who are using more sophisticated methods to steal credit and debit card information. For example, a thief could get someone’s information and create a counterfeit card with a fake chip. 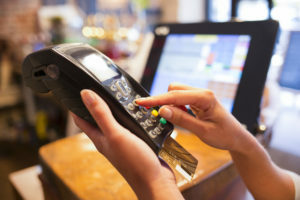 He or she can then tell the retail team member that the chip isn’t working, so the person either has to swipe it or manually input the credit card’s data, negating the chip security. In total, credit card fraud has gone up 16 percent since last year, so the fraud alerts are not hindering the thieves’ progress. This is why we encourage all merchants to learn about our payment solutions to make sure they have the highest level of security to protect their customers’ data. At First Atlantic Commerce, we offer payment gateway solutions with PCI-DSS security, and we have PCI DSS Level 1 Certification. From credit card payment tokenization to P2PE security features, you can rest assured as a merchant that your payment gateway will be secure. Contact us today to learn more about our merchant accounts solutions!